Sea of Thieves patch 1.0.2 has been deployed. 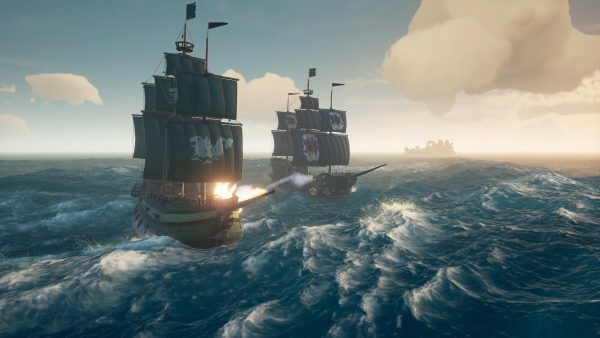 Rare took servers for Sea of Thieves offline yesterday to apply the latest update to the game. One of the biggest takeaways from the patch notes is the increased respawn distance for sunken ships, which has been a testy subject with players from the start. When a player’s ship was sank by another player, their new ship would respawn near enough to the enemy ship for it to sink the player again. This resulted in tons of griefing, and an enormous amount of frustration. Once patch 1.0.2 is applied to the game, Sea of Thieves players who were sunk will now respawn “outside of visible view” of the ship that sank them. That’s great news. Download size: Around 450MB for all platforms. Ship respawn distance – When a ship sinks, we have significantly increased the distance at which the crews new ship will respawn. Ships will now respawn outside of visible view of the ship that sank them. Players may experience details of their pirate (such as hair color / scars) looking different from their initial selection. Achievements earned prior to March 29th are delayed, but will be awarded once our fix is applied.Some players are unable to equip a second weapon. For a potential workaround check the Support Article. For an update on these three issues, please read the Launch Update. Some players have not received their Black Dog Pack code. If you pre-ordered from the official Microsoft Store, please submit a Support ticket through Support. If you pre-ordered from another retailer, please contact them to receive your code. Some players cannot see their downloadable content in game. Please read the Support Article for a potential workaround for this issue. Bounty quest skeletons sometimes do not spawn or cannot be found. If you encounter this bug, a potential work around is to sail away from the island until it’s out of range, and then sail back in to trigger the Island Name banners. If you’re just getting started in Sea of Thieves, we’ve got advice on how to work for all three factions; the Gold Hoarders, the Merchant Alliance and the Order of Souls.